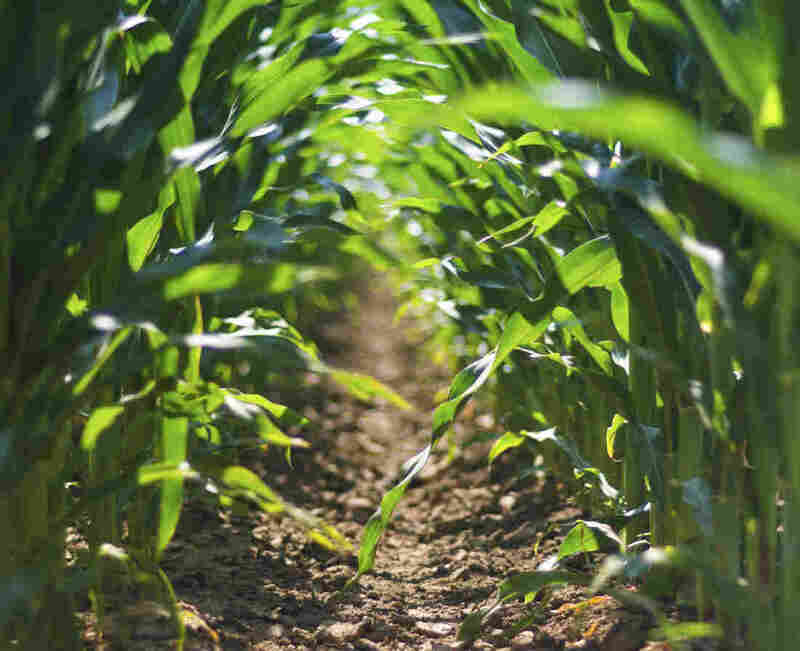 Cornstalks Everywhere But Nothing Else, Not Even A Bee : Krulwich Wonders... You can go to almost any cubic foot of ocean, stream, coral, backyard, ice shelves even, and if you look, you'll find scores of little animals and plants busy making a living. But here's a place — a beautiful, bountiful place — that when you look close — is a desert. ...a very big thing, but I won't tell you what, not yet. Instead, let's take a detour. 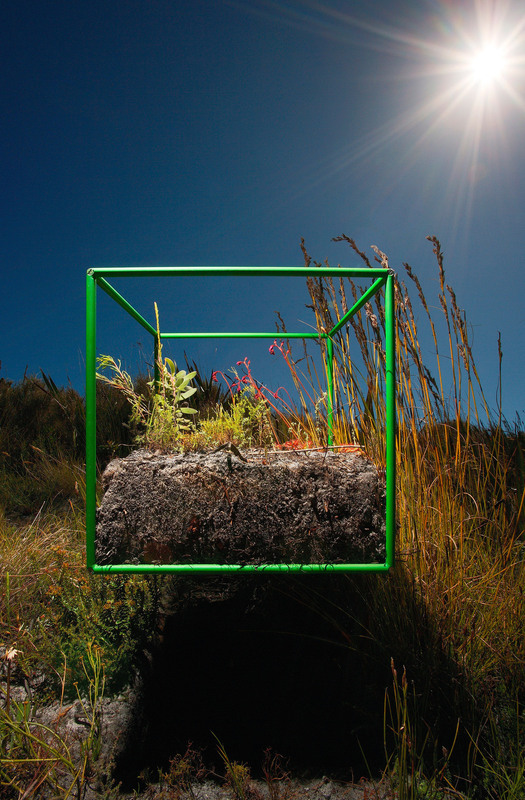 We'll be back to the cornfield in a minute, but just to make things interesting, I'm going to leap halfway around the world to a public park near Cape Town, South Africa, where you will notice a cube, a metal cube, lying there in the grass. 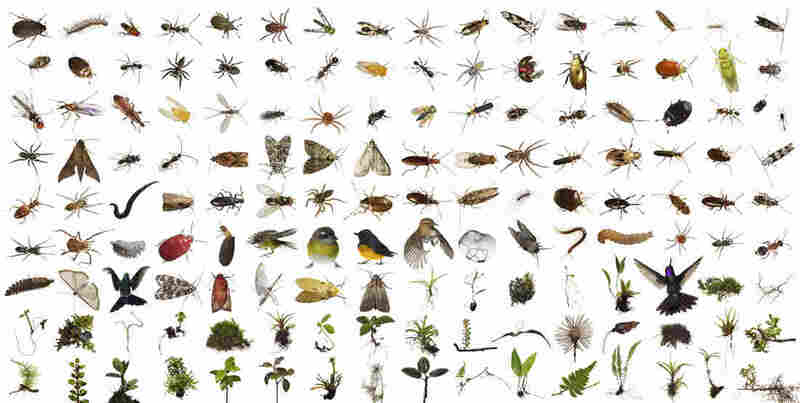 There were 30 different plants in that one square foot of grass, and roughly 70 different insects. 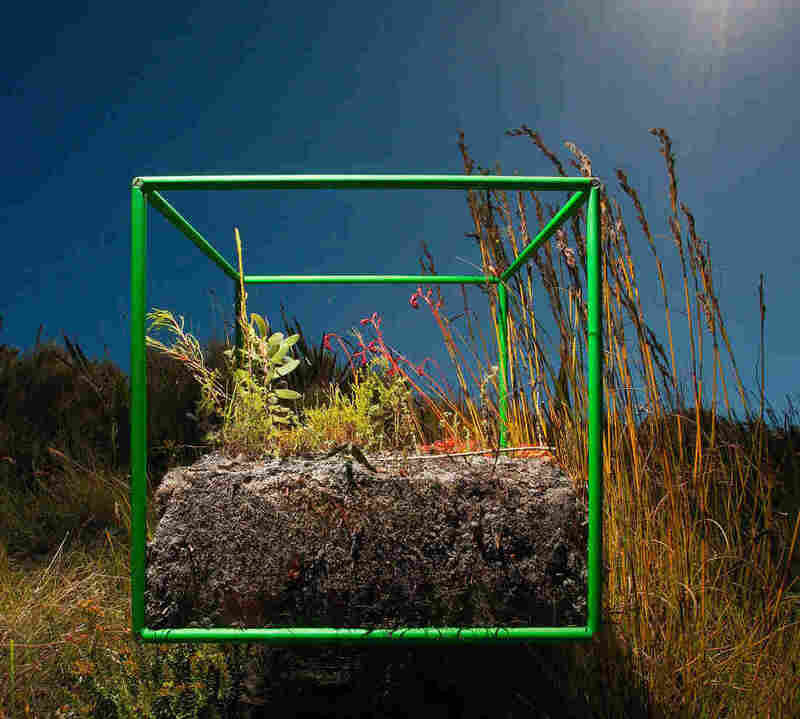 And the coolest part, said a researcher to the Guardian in Britain, "If we picked the cube up and walked 10 feet, we could get as much as 50 percent difference in plant species we encountered. 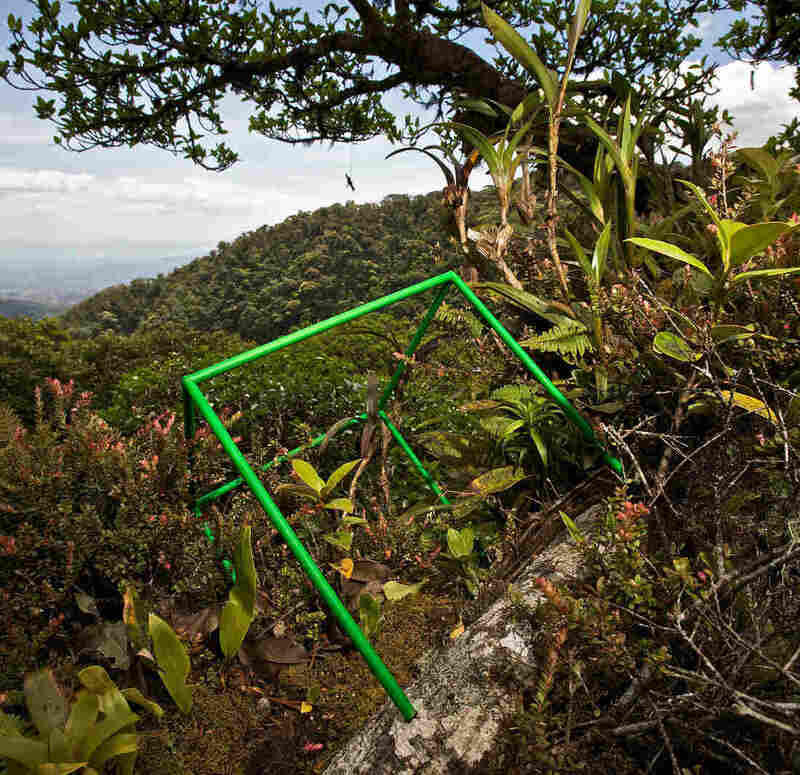 If we moved it uphill, we might find none of the species." Populations changed drastically only a few feet away — and that's not counting the fungi, microbes, and the itsy-bitsies that Liittschwager and his team couldn't see. 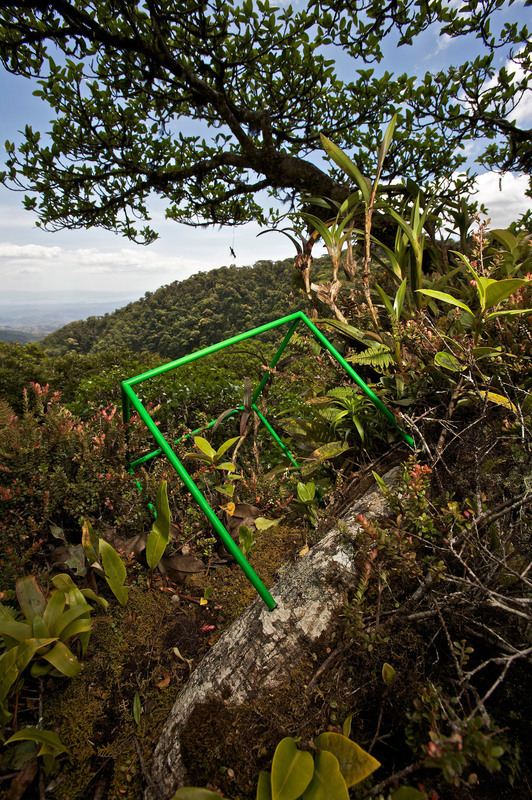 Another example: Here's a cube placed 100 feet off the ground, in the upper branches of a Strangler fig tree in Costa Rica. We're up in the air here, looking down into a valley. E.O. Wilson, the Harvard biologist, in his introduction to David Liittschwager's book of these photographs, says that it's usually big animals that catch our attention. But if we get down on our knees and examine any small patch of ground, "gradually the smaller inhabitants, far more numerous, begin to eclipse them." They are the critters that create and aerate the soil, that pollinate, that remove the clutter. And there are lots and lots and lots of them. Which brings me back to Iowa, where my NPR colleague, commentator and science writer Craig Childs, decided to have a little adventure. As he tells it in his new book, he recruited a friend, Angus, and together they agreed to spend two nights and three days ("We'll call it a long weekend") smack in the middle of a 600-acre farm in Grundy County. Their plan was to settle in amongst the stalks (there are an "estimated three trillion" of them in Iowa) to see what's living there, other than corn. In other words, a Liittschwager-like census. 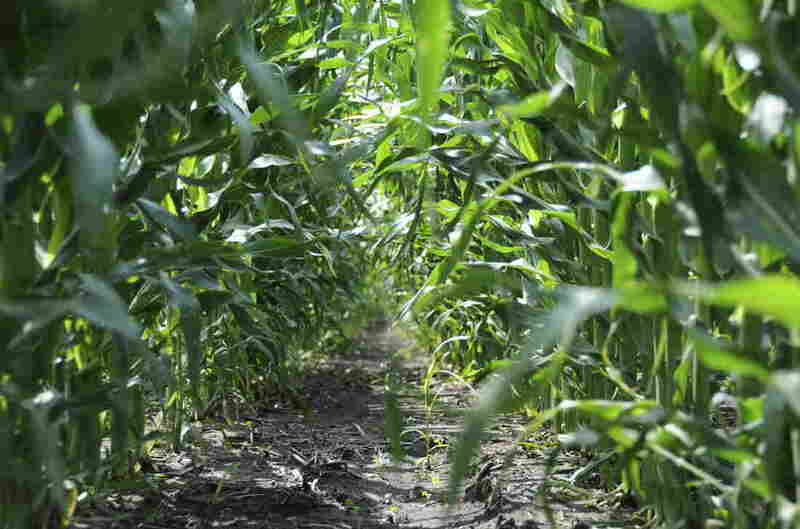 Cornfields, however, are not like national parks or virgin forests. Corn farmers champion corn. Anything that might eat corn, hurt corn, bother corn, is killed. 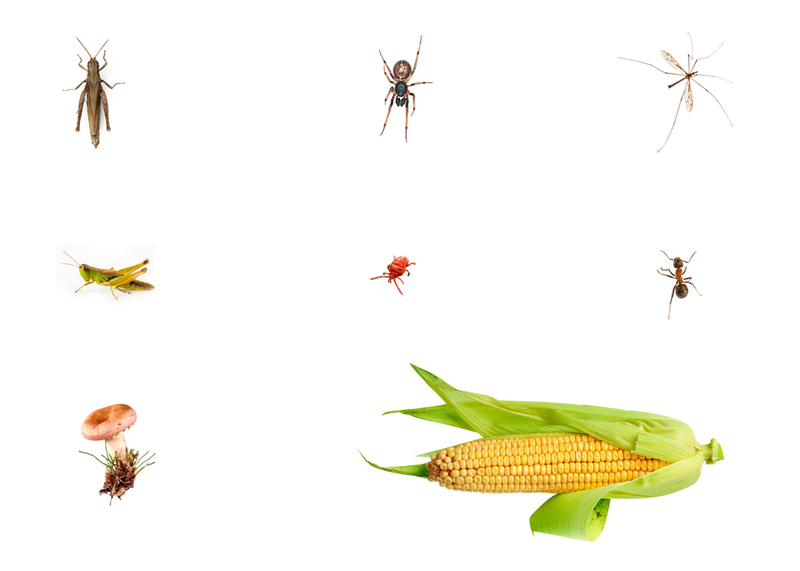 Their corn is bred to fight pests. The ground is sprayed. The stalks are sprayed again. So, like David, Craig wondered, "What will I find?" The answer amazed me. He found almost nothing. "I listened and heard nothing, no bird, no click of insect." There were no bees. The air, the ground, seemed vacant. He found one ant "so small you couldn't pin it to a specimen board." A little later, crawling to a different row, he found one mushroom, "the size of an apple seed." (A relative of the one pictured below.) Then, later, a cobweb spider eating a crane fly (only one). A single red mite "the size of a dust mote hurrying across the barren earth," some grasshoppers, and that's it. Though he crawled and crawled, he found nothing else. "It felt like another planet entirely," he said, a world denuded. Yet, 100 years ago, these same fields, these prairies, were home to 300 species of plants, 60 mammals, 300 birds, hundreds and hundreds of insects. This soil was the richest, the loamiest in the state. And now, in these patches, there is almost literally nothing but one kind of living thing. We've erased everything else. We need to feed our planet, of course. But we also need the teeny creatures that drive all life on earth. There's something strange about a farm that intentionally creates a biological desert to produce food for one species: us. It's efficient, yes. But it's so efficient that the ants are missing, the bees are missing, and even the birds stay away. Something's not right here. Our cornfields are too quiet. 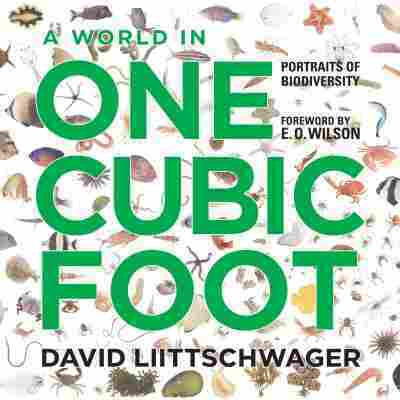 David Liittschwager's book, called A World In One Cubic Foot is a photographic collection of all the plants and animals that turned up in his various cubes, as you see in my post. But the book takes you to many more places, coral reefs, streams, rivers, backyards. Craig Childs' account of his long weekend in the cornfield comes from his book, Apocalyptic Planet; Field Guide to the Everending Earth. Craig writes like a dream; he uses the cornfield as a metaphor for what a mass extinction might be like, where the Earth becomes "lots of one thing and not much of any other."